This article is about the writing system. For other uses, see Cuneiform (disambiguation). Cuneiform script[nb 1] is one of the earliest known systems of writing, distinguished by its wedge-shaped marks on clay tablets, made by means of a blunt reed for a stylus. The name cuneiform itself simply means "wedge shaped", from the Latin cuneus "wedge" and forma "shape," and came into English usage probably from Old French cunéiforme. Emerging in Sumer in the late 4th millennium B.C.E. (the Uruk IV period), cuneiform writing began as a system of pictographs. In the third millennium, the pictorial representations became simplified and more abstract as the number of characters in use grew smaller, from about 1,000 in the Early Bronze Age to about 400 in Late Bronze Age (Hittite cuneiform). The system consists of a combination of logophonetic, consonantal alphabetic and syllabic signs. The original Sumerian script was adapted for the writing of the Akkadian, Eblaite, Elamite, Hittite, Luwian, Hattic, Hurrian, and Urartian languages, and it inspired the Ugaritic and Old Persian alphabets. Cuneiform writing was gradually replaced by the Phoenician alphabet during the Neo-Assyrian Empire. By the 2nd century C.E., the script had become extinct, and all knowledge of how to read it was lost until it began to be deciphered in the 19th century. The cuneiform writing system was in use for more than three millennia, through several stages of development, from the 34th century B.C.E. down to the 2nd century C.E. Ultimately, it was completely replaced by alphabetic writing (in the general sense) in the course of the Roman era and there are no Cuneiform systems in current use. It had to be deciphered as a completely unknown writing system in 19th-century Assyriology. Successful completion of its deciphering is dated to 1857.
shows the pictogram as it was drawn around 3000 B.C.E. shows the rotated pictogram as written around 2800 B.C.E. shows the abstracted glyph in archaic monumental inscriptions, from c. 2600 B.C.E. Sumerian inscription in monumental archaic style, c. 26th century B.C.E. The cuneiform script proper developed from pictographic proto-writing in the late 4th millennium B.C.E. Mesopotamia's "proto-literate" period spans roughly the 35th to 32nd centuries. The first documents unequivocally written in the Sumerian language date to c. the 31st century, found at Jemdet Nasr. Originally, pictographs were either drawn on clay tablets in vertical columns with a sharpened reed stylus, or incised in stone. This early style lacked the characteristic wedge shape of the strokes. From about 2900 B.C.E., many pictographs began to lose their original function, and a given sign could have various meanings depending on context. The sign inventory was reduced from some 1,500 signs to some 600 signs, and writing became increasingly phonological. Determinative signs were re-introduced to avoid ambiguity. Cuneiform writing proper thus arises from the more primitive system of pictographs at about that time (Early Bronze Age II). Letter sent by the high-priest Lu'enna to the king of Lagash (maybe Urukagina), informing him of his son's death in combat, c. 2400 B.C.E., found in Telloh (ancient Girsu). In the mid-3rd millennium B.C.E., writing direction was changed to left to right in horizontal rows (rotating all of the pictographs 90° counter-clockwise in the process), and a new wedge-tipped stylus was used which was pushed into the clay, producing wedge-shaped ("cuneiform") signs; these two developments made writing quicker and easier. By adjusting the relative position of the tablet to the stylus, the writer could use a single tool to make a variety of impressions. The spoken language consisted of many similar sounds, and in the beginning similar sounding words such as "life" [til] and "arrow" [ti] were described in writing by the same symbol. After the Semites conquered Southern Mesopotamia, some signs gradually changed from being pictograms to syllabograms, most likely to make things clearer in writing. In that way the sign for the word "arrow" would become the sign for the sound "ti". If a sound would represent many different words the words would all have different signs, for instance the syllable "gu" had fourteen different symbols. When the words had similar meaning but very different sounds they were written with the same symbol. For instance "tooth" [zu], "mouth" [ka] and "voice" [gu] were all written with the symbol for "voice". To be more accurate they started adding to signs or combine two signs to define the meaning. They used either geometrical patterns or another cuneiform sign. As time went by the cuneiform got very complex and the distinction between a pictogram and syllabogram became vague. Several symbols had too many meanings to permit clarity. Therefore, symbols were put together to indicate both the sound and the meaning of compound. The word "Raven" [UGA] had the same logogram as the words "soap" [NAGA] "name of a city" [ERESH] and "the patron goddess of Eresh" [NISABA]. Two phonetic complements were used to define the word [u] in front of the symbol and [gu] behind. Finally the symbol for "bird" [MUSHEN] was added to ensure proper interpretation. 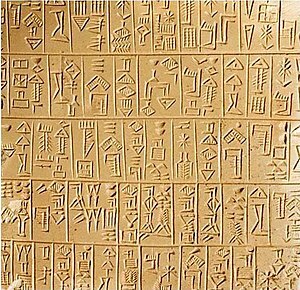 The written part of the Sumerian language was used as a learned written language until the 1st century C.E. The spoken language died out around the 18th century B.C.E. A list of Sumerian deities, c. 2400 B.C.E. 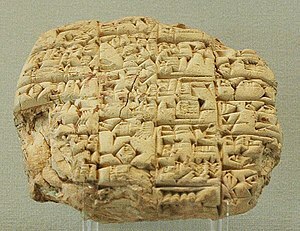 Cuneiform tablet from the Kirkor Minassian collection in the US Library of Congress, c. 24th century B.C.E. 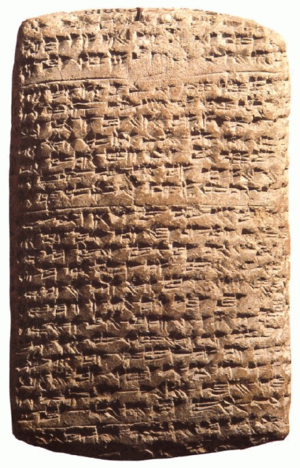 One of the Amarna letters, 14th century B.C.E. Hittite cuneiform is an adaptation of the Old Assyrian cuneiform of c. 1800 B.C.E. to the Hittite language. When the cuneiform script was adapted to writing Hittite, a layer of Akkadian logographic spellings was added to the script, thus the pronunciations of many Hittite words which were conventionally written by logograms are now unknown. 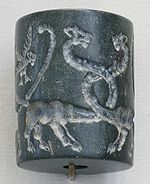 In the Iron Age (c. 10th to 6th centuries B.C.E. ), Assyrian cuneiform was further simplified. From the 6th century, the Assyrian language was marginalized by Aramaic, written in the Aramaean alphabet, but Neo-Assyrian cuneiform remained in use in literary tradition well into Parthian times (250 B.C.E. – 226 C.E.). The last known cuneiform inscription, an astronomical text, was written in 75 C.E. The complexity of the system prompted the development of a number of simplified versions of the script. Old Persian was written in a subset of simplified cuneiform characters known today as Old Persian cuneiform. It formed a semi-alphabetic syllabary, using far fewer wedge strokes than Assyrian used, together with a handful of logograms for frequently occurring words like "god" and "king". The Ugaritic language was written using the Ugaritic alphabet, a standard Semitic style alphabet (an abjad) written using the cuneiform method. For centuries, travellers to Persepolis, in modern-day Iran, had noticed carved cuneiform inscriptions and were intrigued. Attempts at deciphering these Old Persian writings date back to Arabic/Persian historians of the medieval Islamic world, though these early attempts at decipherment were largely unsuccessful. In the 15th century the Venetian Barbero explored ancient ruins in the Middle East and came back with news of a very odd writing he had found carved on the stones in the temples of Shiraz and on many clay tablets. In 1625 the Roman traveler Pietro Della Valle, coming back from Mesopotamia and Persia, brought back a tablet written with cuneiform glyphs he had found in Ur, and also the copy of five characters he had seen in Persepolis. Della Valle understood that the writing had to be read from left to right, following the direction of wedges, but did not attempt to decipher the scripts. Carsten Niebuhr brought the first reasonably complete and accurate copies of the inscriptions at Persepolis to Europe. Bishop Friedrich Münter of Copenhagen discovered that the words in the Persian inscriptions were divided from one another by an oblique wedge and that the monuments must belong to the age of Cyrus and his successors. One word, which occurs without any variation towards the beginning of each inscription, he correctly inferred to signify "king". By 1802 Georg Friedrich Grotefend had determined that two king's names mentioned were Darius and Xerxes (but in their native Old Persian forms, which were unknown at the time and therefore had to be conjectured), and had been able to assign correct alphabetic values to the cuneiform characters which composed the two names. Although Grotefend's Memoir was presented to the Göttingen Academy on September 4, 1802, the Academy refused to publish it; it was subsequently published in Heeren's work in 1815, but was overlooked by most researchers at the time. Meanwhile, in 1835 Henry Rawlinson, a British East India Company army officer, visited the Behistun Inscriptions in Persia. Carved in the reign of King Darius of Persia (522–486 B.C.E. ), they consisted of identical texts in the three official languages of the empire: Old Persian, Babylonian, and Elamite. The Behistun inscription was to the decipherment of cuneiform what the Rosetta Stone was to the decipherment of Egyptian hieroglyphs. Extract from the Cyrus Cylinder (lines 15–21), giving the genealogy of Cyrus the Great and an account of his capture of Babylon in 539 B.C.E. Therefore, a text containing DINGIR and MU in succession could be construed to represent the words "ana", "ila", god + "a" (the accusative ending), god + water, or a divine name "A" or Water. Someone transcribing the signs would make the decision how the signs should be read and assemble the signs as "ana", "ila", "Ila" ("god"+accusative case), etc. A transliteration of these signs, however, would separate the signs with dashes "il-a", "an-a", "DINGIR-a" or "Da". 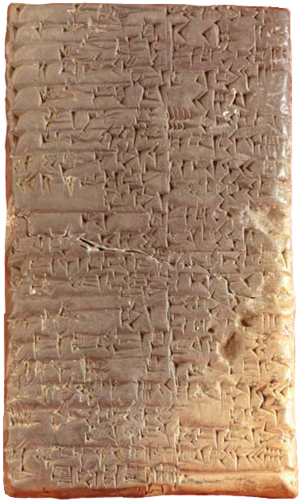 This is still easier to read than the original cuneiform, but now the reader is able to trace the sounds back to the original signs and determine if the correct decision was made on how to read them. A transliterated document thus presents both the reading preferred by the transliterating scholar as well as the opportunity to reconstruct the original text. There are differing conventions for transliterating Sumerian, Akkadian (Babylonian) and Hittite (and Luwian) cuneiform texts. One convention that sees wide use across the different fields is the use of acute and grave accents as an abbreviation for homophone disambiguation. Thus, u is equivalent to u1, the first glyph expressing phonetic u. An acute accent, ú, is equivalent to the second, u2, and a grave accent ù to the third, u3 glyph in the series (while the sequence of numbering is conventional but essentially arbitrary and subject to the history of decipherment). In Sumerian transliteration, a multiplication sign 'x' is used to indicate ligatures. As shown above, signs as such are represented in capital letters, while the specific reading selected in the transliteration is represented in small letters. Thus, capital letters can be used to indicate a so-called Diri compound – a sign sequence that has, in combination, a reading different from the sum of the individual constituent signs (for example, the compound IGI.A – "water" + "eye" – has the reading imhur, meaning "foam"). In a Diri compound, the individual signs are separated with dots in transliteration. Capital letters may also be used to indicate a Sumerogram (for example, KÙ.BABBAR – Sumerian for "silver" – being used with the intended Akkadian reading kaspum, "silver"), an Akkadogram, or simply a sign sequence of whose reading the editor is uncertain. Naturally, the "real" reading, if it is clear, will be presented in small letters in the transliteration: IGI.A will be rendered as imhur4. Since the Sumerian language has only been widely known and studied by scholars for approximately a century, changes in the accepted reading of Sumerian names have occurred from time to time. Thus the name of a king of Ur, read Ur-Bau at one time, was later read as Ur-Engur, and is now read as Ur-Nammu or Ur-Namma; for Lugal-zaggisi, a king of Uruk, some scholars continued to read Ungal-zaggisi; and so forth. Also, with some names of the older period, there was often uncertainty whether their bearers were Sumerians or Semites. If the former, then their names could be assumed to be read as Sumerian, while, if they were Semites, the signs for writing their names were probably to be read according to their Semitic equivalents, though occasionally Semites might be encountered bearing genuine Sumerian names. There was also doubt whether the signs composing a Semite's name represented a phonetic reading or a logographic compound. Thus, e.g. when inscriptions of a Semitic ruler of Kish, whose name was written Uru-mu-ush, were first deciphered, that name was first taken to be logographic because uru mu-ush could be read as "he founded a city" in Sumerian, and scholars accordingly retranslated it back to the original Semitic as Alu-usharshid. It was later recognized that the URU sign can also be read as rí and that the name is that of the Akkadian king Rimush. The Sumerian cuneiform script had on the order of 1,000 distinct signs (or about 1,500 if variants are included). This number was reduced to about 600 by the 24th century B.C.E. and the beginning of Akkadian records. Not all Sumerian signs are used in Akkadian texts, and not all Akkadian signs are used in Hittite. Lo, Lawrence (2007). "Sumerian". Retrieved June 5, 2009. ↑ 2.0 2.1 2.2 2.3 Lo 2007. ↑ 4.0 4.1 Watkins, Lee; Snyder, Dean (2003), The Digital Hammurabi Project (PDF), The Johns Hopkins University, Since the decipherment of Babylonian cuneiform some 150 years ago museums have accumulated perhaps 300,000 tablets written in most of the major languages of the Ancient Near East – Sumerian, Akkadian (Babylonian and Assyrian), Eblaite, Hittite, Persian, Hurrian, Elamite, and Ugaritic. These texts include genres as variegated as mythology and mathematics, law codes and beer recipes. In most cases these documents are the earliest exemplars of their genres, and cuneiformists have made unique and valuable contributions to the study of such moderns disciplines as history, law, religion, linguistics, mathematics, and science. In spite of continued great interest in mankind’s earliest documents it has been estimated that only about 1/10 of the extant cuneiform texts have been read even once in modern times. There are various reasons for this: the complex Sumero/Akkadian script system is inherently difficult to learn; there is, as yet, no standard computer encoding for cuneiform; there are only a few hundred qualified cuneiformists in the world; the pedagogical tools are, in many cases, non-optimal; and access to the widely distributed tablets is expensive, time-consuming, and, due to the vagaries of politics, becoming increasingly difficult. ↑ Marckham Geller, "The Last Wedge," Zeitschrift für Assyriologie und vorderasitische Archäologie 86 (1997): 43–95. ↑ 7.0 7.1 7.2 7.3 7.4 7.5 7.6 Sayce 1908. ↑ El Daly, Okasha (2004). Egyptology: The Missing Millennium : Ancient Egypt in Medieval Arabic Writings. Routledge. pp. 39–40 & 65. ISBN 1-84472-063-2. ↑ 23.0 23.1 Bertman 2005, p. 27. ↑ 24.0 24.1 Bertman 2005, p. 28. This page was last modified on 5 May 2015, at 22:45.